Enlisting the talent of a professional 24-piece soprano chamber choir, V Soprano Choir is a 1-octave, plus a 4th, section powered by advanced scripting features within Kontakt. V Soprano Choir does not incorporate sampled vocal phrases but a selection of sustained vocal elements – Sah, Tah, Voh and etc. In addition, you will find the more common sustained vowels – Ah, Ee, Oh and Oo. Special features include sample offset polyphonic legato, creation and storage of custom vocal verses, attack and release control per vocal step and real-time playback sequencing by way of by way of the Bela D Media’s V Script. Sustained vowels (Non-looped) approximately 6-8 seconds long. Sustained Elements (Non-looped) approximately 6-8 seconds long. V Script is a sophisticated power tool designed to ease the burden of the working composer. Most aspects are done behind the scenes or on the fly. The composer simply needs to create vocal sequences (a group of elements) and store each by a simple press of a Key-switch. 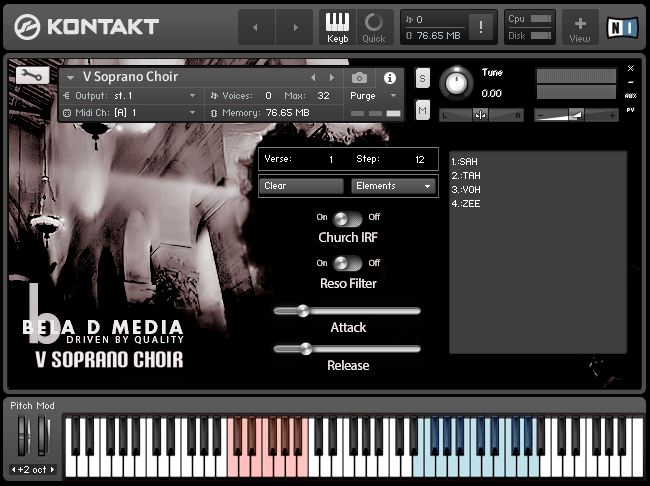 For a limited time, subscribers of Bela D Media’s newsletter may download a free, 3-note Kontakt demo of V Soprano Choir. There is no loss of quality or scripting features. To obtain this download, please enter the subscribers page and enter the password provided when signing up to the newsletter. Presently all Bela D Media products require the full version of Native Instruments Kontakt. Our products do not include a Player/Engine/VSTi. Any Player/Engine/VSTi you may own from another product cannot be used. This includes the free Kontakt player or demo modes. Native Instruments Kontakt 4/5. Tested successfully in Kontakt 6 but not yet officially stated to be compatible. This product is protected by Copyright laws of the United States of America (§ 201. Ownership of copyright). Piracy of this data is expressly prohibited. You understand and agree that any form of data sharing and/or reselling of this product is strictly forbidden and punishable by applicable infringement laws.You understand and agree that Bela D Media reserves the right to seek damages against any persons proven to be in violation of stated terms.